In Todai nadu there are twenty two places which were visited and sung in all by five alvars. Out of these only eleven places were visited by the four early alvars all of whom belonged to that region. The other eleven places were sung by Tirumangai alvar only. 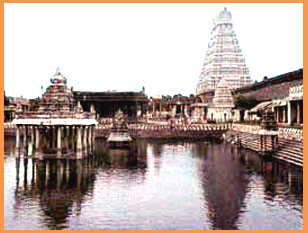 In fact none of the alvar who belonged to the Pandya and the Malai or Chera nadu visited any of the temples in Tondai nadu, although some of them (particularly Sri Nammalavar) managed to visit Tiruvengadam after visiting Tiruvinnagaram and Tirukkudandai (Kumba konam). This would justify the assumption that the Tamilians of the extreme south had not in those days an attachment to the northerners and did not care to assess the greatness of the early alvars in combating the heretic religions of Buddhism and Jainism long before the people in the extreme south had to face the problems.